This is the third and final article of a three-part monthly series in Machine Design on measuring product development at the CXO level. The first article addresses productivity and efficiency. The second article addresses effectiveness and output. This final article addresses maturity and predictability. The August article is entitled "Measuring Product Development Productivity." [Machine Design - August 2016] Productivity is an extremely important topic, especially in challenging economic times. 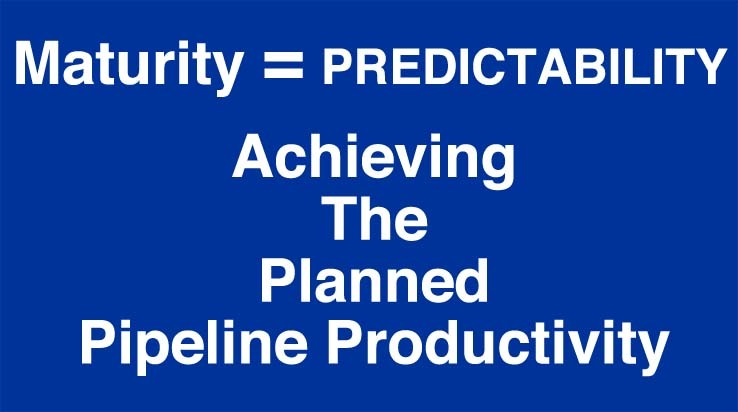 It is absolutely appropriate for today's corporate leaders and managers to emphasize "Productivity." However, productivity measurement is becoming too pervasive across all business functions. And, productivity measurement is being applied at levels that are too low in many organizations. Productivity may not be the best #1 metric for business areas that are not yet mature in their execution. The September article is entitled "Measuring Product Development Effectiveness." [Machine Design - September 2016] This article delves further into the appropriateness of productivity as the primary measure for business areas that have not yet matured, such as R&D and product development. It makes the case that "Effectiveness" may be a preferable #1 metric for immature functions and disciplines. Product Management, R&D, and Product Development (among others) all have several decades remaining before maturity is reached. The October article is entitled "Measuring Product Development Maturity." [Machine Design - October 2016] It would not be right to use "Maturity" as the factor in the first two articles to distinguish between the use of "productivity" versus "effectiveness" as the primary KPI, without also providing a definition of "maturity" for these so-called immature functions. The ability to accurately predict input needs and output results is the business-level definition of maturity. The exact components of input and output maturity will differ by business area. The Carnegie-Mellon Software Engineering Institute "Capability Maturity Model" is also discussed.